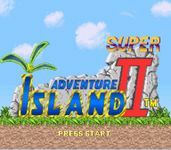 "Super Adventure Island II (高橋名人の大冒険島Ⅱ, Takahashi Meijin no Daibōken Jima Tsū, "Master Takahashi's Great Adventure Island II") is a Super NES video game by Hudson Soft and was the final entry in the series, until Hudson announced in 2009 a new game on WiiWare called Adventure Island: The Beginning. Unlike most of the previous games, this one is not a straight platformer; instead, it plays like an action/adventure game that encourages exploration, similar to the later Wonder Boy games." Source: Wikipedia, "Super_Adventure_Island_II," available under the CC-BY-SA License.